Warm, fluffy and waiting for butter. Yesterday was a write-off in every sense of the word. It was a miserable day outside with rain and some wind gusts. We had no internet for 10 hours and even the TV was out. (We have opted to not buy satellite TV or cable.) Sucky. Luckily I had plenty of tasks I could do. Funnily, I didn’t do any of them. Two are hanging a new bathroom door and building a stand for our washer and dryer. Nope. They didn’t get touched. Early yesterday morning I was up squeezing almonds to make almond milk. So I had moist almond meal that had to be dealt with or thrown away. I chose not to throw it away. I spread it in a thin layer on a baking sheet and stuck it in the oven to dry. 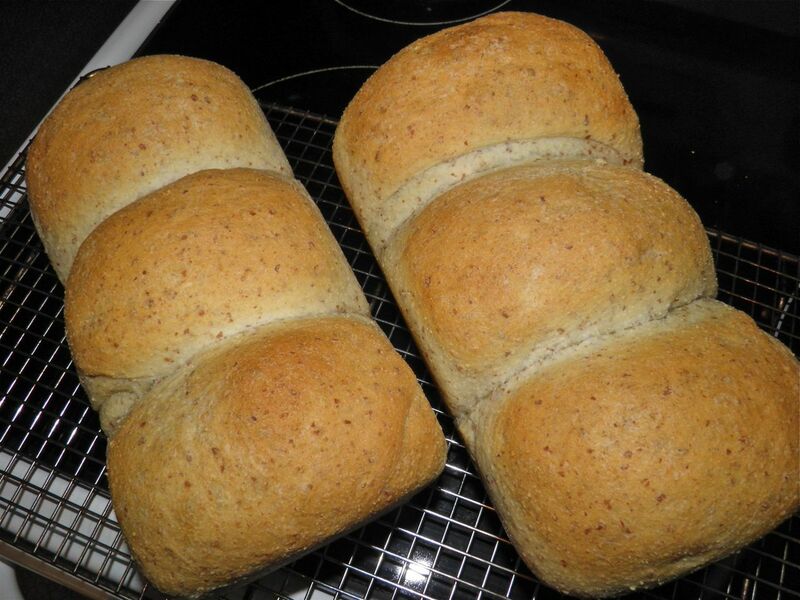 A few simple whirs in the food processor reduced it to a fine meal – almost like flour. From there, I took my meal and added it to bread dough. Since it is gluten free, you can’t just substitute it all or you’ll bake a brick. You need that evil white four to give your bread structure. According to the post it is among the worst stuff on the planet, and is responsible for starting WWII and the current tensions in Korea. Well... not really, but it seemed almost that bad. I took umbrage at a fair deal of it. For example, one reason it was bad was that it is full of Omega 6 fatty acids. Aren’t those the good ones? It seemed to me like a fair amount of well articulated bull sh*t. There were some important points made, but it was all more a case of “all things in moderation” than outright bad. But it certainly didn’t come off that way. If you examine anything we eat, or how we cook it, you could find similar problems. So we sit in the corner, quivering, and starve. So what’s good about almond flour? Well, first off, it’s nuts. The consumption of nuts has been proven to help in the reduction of cholesterol in the diet, which can lead to lower risk for heart disease and stroke. That info that comes from the American Dietetic Association. Almond flour, although higher in fat than whole wheat, contains mostly monounsaturated and polyunsaturated fats, and no trans fat. You can get 1/3 of your daily vitamin E from 1/2 cup of almonds and 20% of your daily magnesium. You can also get 12 g of protein and 6 g of fibre. So it’s not all bad, now is it? This was also a good way for me to use a by-product of the very delicious almond milk I made yesterday. So it was win-win, at least for me. It certainly didn’t hurt my bread, except it didn’t rise quite as high as an all flour dough. It was also flecked with cute little pieces of almond skin. 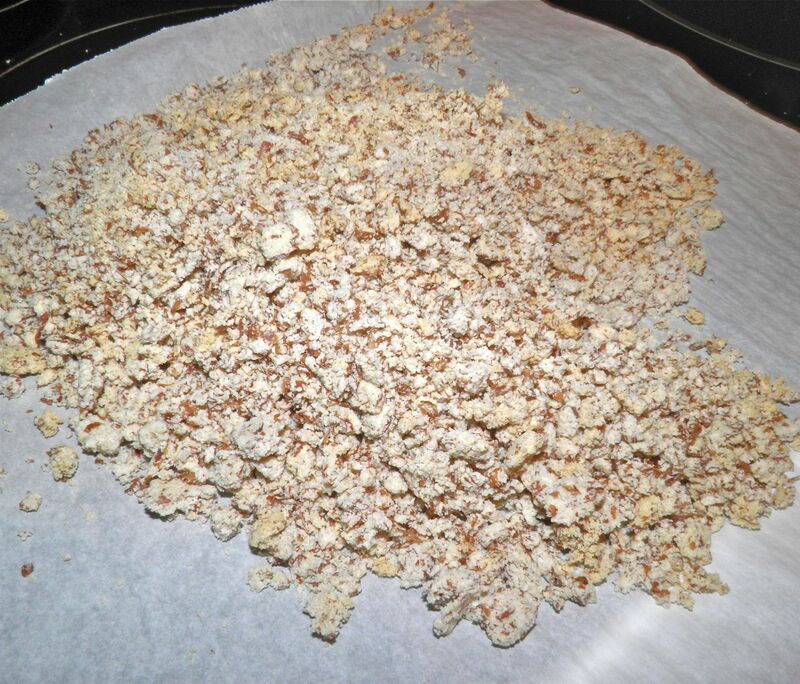 So if you do have almond meal leftover from making almond milk, you may want to give this a try. It’s far better than throwing that meal away. Get two food products from one ingredient. Don’t be nuts – almonds are expensive! I couldn’t resist the pun...sorry. Proof the yeast and sugar in the warm water for 10-15 minutes until it is creamy and bubbly. 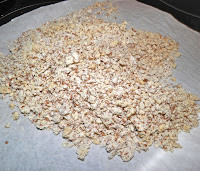 Place the almond, white flour and salt in a fairly large bowl. Add the proofed yeast and additional water and bring together into a mass. two 3-bun loaves. feel free to shape as you wish. Place on the counter and knead for about 5 minutes. It should be fairly smooth but moist feeling. 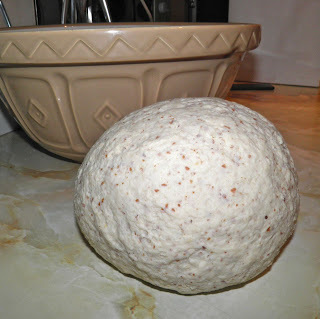 Oil the bowl, place the dough back in and cover with plastic wrap and a towel. Put the bowl in a warm place and let proof for 2.5 hours, or until doubled in bulk. 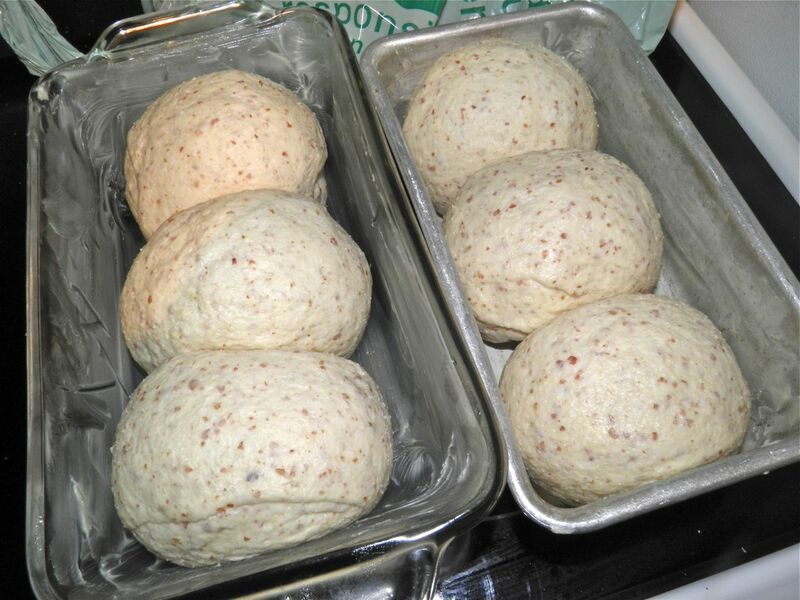 Remove the dough after it has risen, punch down and divide into 6 equal pieces. Shape each one into a ball. Grease two 5” x 9” loaf pans and place 3 of the balls in each one. Cover lightly again and let rise until doubles, about 1 hour. While the dough is rising, preheat the oven to 400°F. Place a pan of water on the bottom rack to add moisture to the oven. 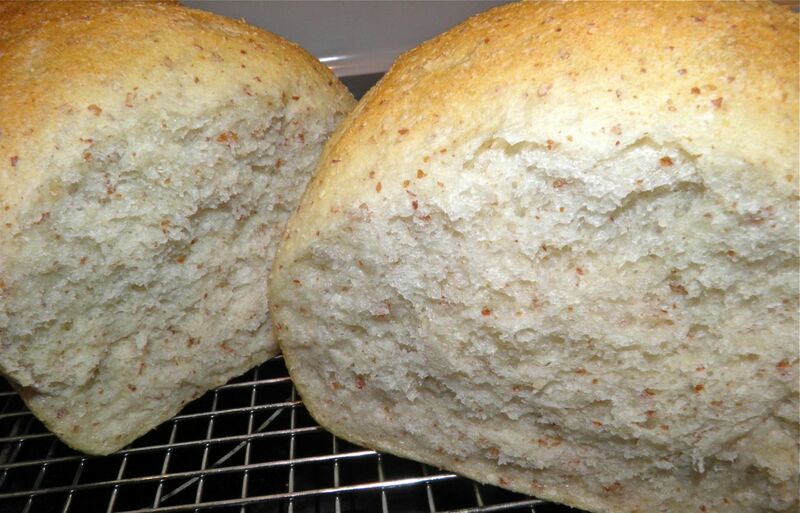 Once risen, bake the loaves for 30 minutes (removing the water pan at the 10 minute mark), until golden on top and hollow sounding when tapped lightly with your fingers.